Star Trek is an American space opera media franchise based on the science fiction television series created by Gene Roddenberry. The first television series, simply called Star Trek and now referred to as "The Original Series", debuted in 1966 and aired for three seasons on NBC. The Star Trek canon includes The Original Series, an animated series, five spin-off television series, and thirteen films. William Shatner played Captain James T. Kirk in The Original Series, The Animated Series, and seven films. Star Trek: The Original Series, frequently abbreviated as TOS,[b] debuted in the United States on NBC on September 8, 1966. The show tells the tale of the crew of the starship Enterprise and its five-year mission "to boldly go where no man has gone before." The original 1966–69 television series featured William Shatner as Captain James T. Kirk, Leonard Nimoy as Spock, DeForest Kelley as Dr. Leonard "Bones" McCoy, James Doohan as Montgomery "Scotty" Scott, Nichelle Nichols as Uhura, George Takei as Hikaru Sulu, and Walter Koenig as Pavel Chekov. During the series' original run, it earned several nominations for the Hugo Award for Best Dramatic Presentation and won twice: for the two-part "The Menagerie", and the Harlan Ellison-written episode "The City on the Edge of Forever". NBC canceled the show after three seasons; the last original episode aired on June 3, 1969. A petition near the end of the second season to save the show signed by many Caltech students and its multiple Hugo nominations would indicate that despite low Nielsen ratings, it was highly popular with science fiction fans and engineering students. The series later became popular in reruns and found a cult following. In the 2000s, the series was remastered for television, which included special-effect changes including CGI versions of the ships. Star Trek: The Animated Series, produced by Filmation, ran for two seasons from 1973 to 1974. Most of the original cast performed the voices of their characters from The Original Series, and some of the writers who worked on The Original Series returned, including D. C. Fontana, David Gerrold, and Paul Schneider. While the animated format allowed the producers to create more exotic alien landscapes and life forms, animation errors and liberal reuse of shots and musical cues have tarnished the series' reputation. Although it was originally sanctioned by Paramount, which owned the Star Trek franchise following its acquisition of Desilu in 1967, Gene Roddenberry often spoke of TAS as non-canon. Star Trek writers have used elements of the animated series in later live-action series and films, and as of June 2007[update], TAS has references in the library section of the official Startrek.com website, officially bringing the series into the franchise's main canon. The Animated Series won Star Trek's first Emmy Award on May 15, 1975. Star Trek: TAS briefly returned to television in the mid-1980s on the children's cable network Nickelodeon. Nickelodeon parent Viacom would purchase Paramount in 1994; in the early 1990s, the Sci-Fi Channel also began rerunning TAS. The complete series was also released on Laserdisc format during the 1980s. The complete series was first released in the U.S. on eleven volumes of VHS tapes in 1989. All 22 episodes were released on DVD in 2006. 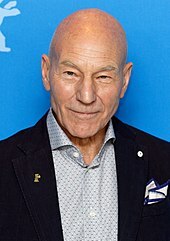 Patrick Stewart played Captain Jean-Luc Picard in The Next Generation and subsequent films. Star Trek: The Next Generation, frequently abbreviated as TNG, takes place about a century after The Original Series (2364–2370). It features a new starship, Enterprise-D, and a new crew led by Captain Jean-Luc Picard (Patrick Stewart) and Commander William Riker (Jonathan Frakes). Some crewmembers represent new alien races, including Deanna Troi, a half-Betazoid counselor played by Marina Sirtis. Michael Dorn plays Worf, the first Klingon officer in Starfleet, alongside Gates McFadden as Dr. Beverly Crusher, LeVar Burton as chief engineer Geordi La Forge, the android Data portrayed by Brent Spiner, and Dr. Crusher's son Wesley Crusher played by Wil Wheaton. The show premiered on September 28, 1987 and ran for seven seasons, ending on May 23, 1994. It had the highest ratings of any of the Star Trek series and became the #1 syndicated show during the last few years of its original run, allowing it to act as a springboard for ideas in other series. Many relationships and races introduced in TNG became the basis of episodes in Deep Space Nine and Voyager. During its run it earned several Emmy awards and nominations—including a nomination for Best Dramatic Series during its final season—two Hugo Awards and a Peabody Award for Outstanding Television Programming for the episode "The Big Goodbye". The series was released in high definition on Blu-Ray and Netflix with some special effect changes in the 2010s. Avery Brooks played Captain Benjamin Sisko in Deep Space Nine, commander of the titular space station. Star Trek: Deep Space Nine, frequently abbreviated as DS9, takes place during the last years and the immediate post-years of The Next Generation (2369–2375) and aired for seven seasons, debuting the week of January 3, 1993. Like Star Trek: The Next Generation, it aired in syndication in the United States and Canada. Unlike the other Star Trek series, DS9 takes place primarily on a space station rather than aboard a starship. The show begins after the brutal Cardassian occupation of the planet Bajor. The liberated Bajoran people ask the United Federation of Planets to help run a Cardassian-built space station, Deep Space Nine, near Bajor. After the Federation takes control of the station, the protagonists of the show discover a uniquely stable wormhole that provides immediate access to the distant Gamma Quadrant making Bajor and the station one of the most strategically important locations in the galaxy. The show chronicles the events of the station's crew, led by Commander (later Captain) Benjamin Sisko, played by Avery Brooks, and Major (later Colonel) Kira Nerys, played by Nana Visitor. Recurring plot elements include the repercussions of the Cardassian occupation of Bajor, Sisko's spiritual role for the Bajorans as the Emissary of the Prophets, and in later seasons a war with the Dominion. Deep Space Nine stands apart from earlier Trek series for its lengthy serialized storytelling, conflict within the crew, and religious themes—all elements that critics and audiences praised but Roddenberry forbade in the original series and The Next Generation. Kate Mulgrew played Captain Kathryn Janeway, the lead character in Voyager, and the first female commanding officer in a leading role of a Star Trek series. Star Trek: Voyager ran for seven seasons, airing from January 16, 1995, to May 23, 2001, launching a new Paramount-owned television network, UPN. It features Kate Mulgrew as Captain Kathryn Janeway, the first female commanding officer in a leading role of a Star Trek series, and Commander Chakotay, played by Robert Beltran. Voyager takes place at about the same time period as Deep Space Nine and the years following that show's end (2371–2378). The premiere episode has the USS Voyager and its crew pursue a Maquis (Federation rebels) ship. Both ships become stranded in the Delta Quadrant about 70,000 light-years from Earth. Faced with a 75-year voyage to Earth, the crew must learn to work together to overcome challenges on their long and perilous journey home while also seeking ways to shorten the voyage. Like Deep Space Nine, early seasons of Voyager feature more conflict between its crewmembers than seen in later episodes. Such conflict often arises from friction between "by-the-book" Starfleet crew and rebellious Maquis fugitives forced by circumstance to work together on Voyager. Eventually, though, they settle their differences, after which the overall tone becomes more reminiscent of The Original Series. The starship Voyager, isolated from its home, faces new cultures and dilemmas not possible in shows based in the Alpha Quadrant. Later seasons brought in an influx of characters and cultures from prior shows, such as the Borg, Q, the Ferengi, Romulans, Klingons, Cardassians and cast members of The Next Generation. Scott Bakula played Captain Jonathan Archer, the lead character in Enterprise. Star Trek: Enterprise, originally entitled Enterprise, is a prequel to the original Star Trek series. It aired from September 26, 2001 to May 13, 2005. Enterprise takes place in the 2150s, some 90 years after the events of Zefram Cochrane's first warp flight and about a decade before the founding of the Federation. The show centers on the voyages of Earth's first warp 5 capable starship, Enterprise, commanded by Captain Jonathan Archer (played by Scott Bakula), and the Vulcan Sub-Commander T'Pol (played by Jolene Blalock). The show originally did not include "Star Trek" in its name and logo, adding it later on in the show's run. During the show's first two seasons, Enterprise featured self-contained episodes, like The Original Series, The Next Generation and Voyager. The entire third season consisted of one arc related to the Xindi, and had a darker tone and serialized nature similar to that of Deep Space Nine. The fourth and final season consisted of several mini-arcs composed of two to three episodes. The final season showed the origins of some elements of previous series, and resolved some of their continuity problems. Ratings for Enterprise started strong but declined rapidly. Although critics received the fourth season well, both fans and the cast criticized the series finale, partly because of the episode's focus on the guest appearance of members of The Next Generation cast. The cancellation of Enterprise ended an 18-year run of back-to-back new Star Trek television, which began with The Next Generation in 1987. 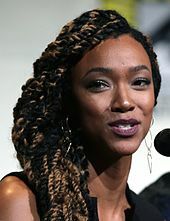 Sonequa Martin-Green plays Commander Michael Burnham, the lead character in Discovery. Star Trek: Discovery is a direct prequel to Star Trek: The Original Series, set roughly ten years beforehand. It premiered September 24, 2017 in the United States and Canada on CBS before moving to CBS All Access, while Netflix streams the show outside the United States and is also providing most of the show's funding. The show centers on the voyages of the Discovery, commanded by Captain Gabriel Lorca (played by Jason Isaacs), and Lieutenant Commander Michael Burnham (played by Sonequa Martin-Green), with Burnham being the lead character of the series. This marks the first Star Trek series to feature a First Officer as the lead character. The show features the Klingon T'Kuvma attempting to unite the 24 great Klingon houses, leading to a war between his race and the United Federation of Planets that involves the crew of the Discovery. Star Trek: Short Treks is a spin-off series of stand-alone short films which focus on characters and situations from Discovery. Some of the future episodes will be animated. An upcoming CBS All Access series will see Patrick Stewart reprise his role as Jean-Luc Picard. Stewart himself announced this on August 4, 2018, and later said the series would be set 19 years after the end of The Next Generation, or 10 years after Star Trek: Nemesis. On October 25, 2018, CBS All Access announced a two-season order for a half-hour adult animated comedy series created by Mike McMahan, the head writer and executive producer of Rick and Morty. It focuses on the support crew of "one of Starfleet's least important ships," and shares a name with a Next Generation episode. Announced in January 2019, a live-action television series will focus on the mirror universe's Philippa Georgiou and her adventures as a member of Starfleet's Section 31 division. Michelle Yeoh will reprise her role from Star Trek: Discovery, with Bo Yeon Kim and Erika Lippoldt serving as co-showrunners. The series is reported to feature an ensemble cast. In February 2019, it was announced that an animated series developed for young viewers is currently in development. The series is being co-written and created by Dan and Kevin Hageman. The series will air on Nickelodeon as a joint-venture with CBS. Paramount Pictures has produced thirteen Star Trek feature films, the most recent being released in July 2016. The first six films continue the adventures of the cast of The Original Series; the seventh film, Generations was designed as a transition from that cast to The Next Generation television series; the next three films, 8–10, focused completely on the The Next Generation cast. [c] Starting with the eleventh film, the movies take place in an alternate timeline with a new cast playing the original series characters. Leonard Nimoy portrays an elderly Spock in these films, providing a physical link to the original timeline. This alternate timeline has been named by CBS, for the computer game Star Trek Online, the Kelvin Timeline. Star Trek creator Gene Roddenberry first suggested the idea of a Star Trek feature in 1969. When the original television series was canceled, he lobbied to continue the franchise through a film. The success of the series in syndication convinced the studio to begin work on a feature film in 1975. A series of writers attempted to craft a suitably epic screenplay, but the attempts did not satisfy Paramount, so the studio scrapped the project in 1977. Paramount instead planned on returning the franchise to its roots with a new television series, Star Trek: Phase II. The massive worldwide box office success of Star Wars in mid-1977 sent Hollywood studios to their vaults in search of similar sci-fi properties that could be adapted or re-launched to the big screen. When Columbia's Close Encounters of the Third Kind had a huge opening in late December 1977, Paramount was convinced that science fiction films other than Star Wars could do well at the box office, and production of Phase II was cancelled in favor of making a Star Trek film. A massive energy cloud from deep space heads toward Earth, leaving destruction in its wake, and the Enterprise must intercept it to determine what lies within, and what its intent might be. The movie borrows many elements from "The Changeling" of the original series and "One of Our Planets Is Missing" from the animated series. Principal photography commenced on August 7, 1978 with director Robert Wise helming the feature. The production encountered difficulties and slipped behind schedule, with effects team Robert Abel and Associates proving unable to handle the film's large amount of effects work. Douglas Trumbull was hired and given a blank check to complete the effects work in time and location; the final cut of the film was completed just in time for the film's premiere. The film introduced an upgrade to the technology and starship designs, making for a dramatic visual departure from the original series. Many of the set elements created for Phase II were adapted and enhanced for use in the first feature films. It received mixed reviews from critics; while it grossed $139 million the price tag had climbed to about $35 million due to costly effects work and delays. Khan Noonien Singh (Ricardo Montalbán), whom Kirk thwarted in his attempt to seize control of the Enterprise fifteen years earlier ("Space Seed"), seeks his revenge on the Admiral and lays a cunning and sinister trap. The Motion Picture's gross was considered disappointing, but it was enough for Paramount to back a sequel with a reduced budget. After Roddenberry pitched a film in which the crew of the Enterprise goes back in time to ensure the assassination of John F. Kennedy, he was "kicked upstairs" to a ceremonial role while Paramount brought in television producer Harve Bennett to craft a better—and cheaper—film than the first. After watching all the television episodes, Bennett decided that the character of Khan Noonien Singh was the perfect villain for the new film. Director Nicholas Meyer finished a complete screenplay in just twelve days, and did everything possible within budget to give The Wrath of Khan a nautical, swashbuckling feel, which he described as "Horatio Hornblower in outer space." Upon release, the reception of The Wrath of Khan was highly positive; Entertainment Weekly's Mark Bernadin called The Wrath of Khan "the film that, by most accounts, saved Star Trek as we know it". Both the first and second films have television versions with additional footage and alternate takes that affect the storyline. (Subsequent Star Trek films tended to have shorter television versions). Especially notable in The Wrath of Khan is the footage establishing that a young crew member who acts courageously and dies during an attack on the Enterprise is Scotty's nephew. The plot picks up shortly after the conclusion of the previous film. When McCoy begins acting irrationally, Kirk learns that Spock, in his final moments, transferred his katra, his living spirit, to the doctor. To save McCoy from emotional ruin, Kirk and crew steal the Enterprise and violate the quarantine of the Genesis Planet to retrieve Spock, his body regenerated by the rapidly dying planet itself, in the hope that body and soul can be rejoined. However, bent on obtaining the secret of Genesis for themselves, a renegade Klingon (Christopher Lloyd) and his crew interfere, with deadly consequences. Meyer declined to return for the next film, so directing duties were given to cast member Leonard Nimoy. Paramount gave Bennett the green light to write Star Trek III the day after The Wrath of Khan opened. The producer penned a resurrection story for Spock that built on threads from the previous film and the original series episode "Amok Time". While returning to stand court-martial for their actions in rescuing Spock, Kirk and crew learn that Earth is under siege by a giant probe that is transmitting a destructive signal, attempting to communicate with the now-extinct species of humpback whales. To save the planet, the crew must time-travel back to the late 20th century to obtain a mating pair of these whales, and a marine biologist (Catherine Hicks) to care for them. Nimoy returned as director for this film. Nimoy and Bennett wanted a film with a lighter tone that did not have a classic antagonist. They decided on a time travel story with the Enterprise crew returning to their past to retrieve something to save their present—eventually, humpback whales. After having been dissatisfied with the script written by Daniel Petrie Jr., Paramount hired Meyer to rewrite the screenplay with Bennett's help. Meyer drew upon his own time travel story Time After Time for elements of the screenplay. Star William Shatner was promised his turn as director for Star Trek V, and Nicholas Meyer returned as director/co-writer for Star Trek VI. Spock's half-brother (Laurence Luckinbill) believes he is summoned by God, and hijacks the brand-new (and problem-ridden) Enterprise-A to take it through the Great Barrier, at the center of the Milky Way, beyond which he believes his maker waits for him. Meanwhile, a young and arrogant Klingon captain (Todd Bryant), seeking glory in what he views as an opportunity to avenge his people of the deaths of their crewmen on Genesis, sets his sights on Kirk. This is the only film in the franchise directed by William Shatner. When Qo'noS' moon Praxis (the Klingon Empire's chief energy source) is devastated by an explosion, caused by overmining, the catastrophe also contaminating Qo'noS' atmosphere, the Klingons make peace overtures to the Federation. While on the way to Earth for a peace summit, the Klingon Chancellor (David Warner) is assassinated by Enterprise crewmen, and Kirk is held accountable by the Chancellor's Chief of Staff (Christopher Plummer). Spock attempts to prove Kirk's innocence, but in doing so, uncovers a massive conspiracy against the peace process with participants from both sides. This film is a sendoff to the original series cast. One Next Generation cast member, Michael Dorn, appears as the grandfather of the character he plays on the later television series. It is the second and last Star Trek film directed by Nicholas Meyer and last screenplay co-authored by Leonard Nimoy. Both the sixth and seventh films acted as transitions between the films featuring the original cast and those with the Next Generation cast, with the sixth focusing on the original cast and the seventh focusing on the TNG cast. The Next Generation cast made four films over a period of eight years, with the last two performing only moderately well (Insurrection) and disappointingly (Nemesis) at the box office. Picard enlists the help of Kirk, who is presumed long dead but flourishes in an extradimensional realm, to prevent a renegade scientist (Malcolm McDowell) from destroying a star and its populated planetary system in an attempt to enter that realm. This film also included original crew members Scotty (James Doohan) and Chekov (Walter Koenig). Following seven seasons of Star Trek: The Next Generation, the next Star Trek film was the first to feature the crew of the Enterprise-D, along with a long prologue sequence featuring three cast members of the original series and the only appearance of the Enterprise-B. After a failed attempt to assault Earth, the Borg attempt to prevent First Contact between Humans and Vulcans by interfering with Zefram Cochrane's (James Cromwell) warp test in the past. Picard must confront the demons which stem from his assimilation into the Collective ("The Best of Both Worlds") as he leads the new Enterprise-E back through time to ensure the test and subsequent meeting with the Vulcans take place. The first of two films directed by series actor Jonathan Frakes. Profoundly disturbed by what he views as a blatant violation of the Prime Directive, Picard deliberately interferes with a Starfleet admiral's (Anthony Zerbe) plan to relocate a relatively small but seemingly immortal population from a mystical planet to gain control of the planet's natural radiation, which has been discovered to have substantial medicinal properties. However, the admiral himself is a pawn in his alien partner's (F. Murray Abraham) mission of vengeance. Insurrection brought in Deep Space Nine writer Michael Piller instead of Ronald D. Moore and Brannon Braga who had written for Generations and First Contact. A clone of Picard (Tom Hardy), created by the Romulans but eventually exiled to hard labor on Remus, assassinates the entire Romulan senate, assumes absolute power, and lures Picard and the Enterprise to Romulus under the false pretence of a peace overture. Written by John Logan and directed by Stuart Baird, this film was a critical and commercial disappointment (released December 13, 2002 in direct competition with Die Another Day, Harry Potter and the Chamber of Secrets and The Lord of the Rings: The Two Towers) and was the final Star Trek film to feature the Next Generation cast and to be produced by Rick Berman. After the poor reception of Star Trek: Nemesis and the cancellation of the television series Star Trek: Enterprise, the franchise's executive producer Rick Berman and screenwriter Erik Jendresen began developing a new film, entitled Star Trek: The Beginning, which would take place after Enterprise but before The Original Series. In February 2007, J. J. Abrams accepted Paramount's offer to direct the new film, having been previously attached as producer. Roberto Orci and Alex Kurtzman wrote a screenplay that impressed Abrams, featuring new actors portraying younger versions of the original series' cast. The Enterprise, its interior, and the original uniforms were redesigned. This revival of the franchise is often considered to be, and referred to as, a "reboot", but it is technically a continuation of the franchise (Nimoy reprises his role of Spock from the previous films) that establishes an alternate reality from the previous films. This route was taken, over a traditional reboot, to free the new films from the restrictions of established continuity without completely discarding it, which the writers felt would have been "disrespectful". This new reality was informally referred to by several names, including the "Abramsverse", "JJ Trek" and "NuTrek", before it was named the "Kelvin Timeline" (versus the "Prime Timeline" of the original series and films) by Michael and Denise Okuda for use in official Star Trek reference guides and encyclopedias. The name Kelvin comes from the USS Kelvin, a starship involved in the event that creates the new reality in Star Trek (2009). Abrams named the starship after his grandfather Henry Kelvin, whom he also pays tribute to in Into Darkness with the Kelvin Memorial Archive. In the 24th century, a supernova destroys Romulus. Piloting a one-man vessel, Spock (Leonard Nimoy) attempts to contain the supernova by generating an artificial black hole, but is assaulted by a Romulan mining vessel captained by Nero (Eric Bana), who is bent on vengeance for Spock's failure to save Romulus; both vessels are pulled into the black hole and sent back in time to the 23rd century. Nero then captures Spock and uses the black-hole technology to destroy Vulcan. Spock's present-day younger self (Zachary Quinto), who is a Starfleet Academy instructor, and a volatile and arrogant cadet named James Kirk (Chris Pine) must then set aside their current differences, and join forces to prevent Nero from consigning Earth and the rest of the Federation worlds to similar fates. This film acts as a reboot to the existing franchise by taking place in an "alternate reality" using the plot device of time travel to depict an altered timeline (known as the Kelvin Timeline, after the ship destroyed in the opening scene), featuring younger versions of the original series' cast. It is the first production to feature an entirely different cast of actors playing roles previously established by other actors, with the exception of an aged Spock played by Leonard Nimoy. It was directed by J. J. Abrams (who produced it with Damon Lindelof) and written by Roberto Orci and Alex Kurtzman. According to Lindelof, this production was designed to attract a wider audience. It received positive reviews and a number of awards, including the film franchise's only Academy Award, for "makeup and hairstyling". A story that covered the events between Nemesis and Star Trek was released as the graphic novel Star Trek: Countdown in early 2009. A Starfleet special agent (Benedict Cumberbatch), coerces an officer into blowing up a secret installation in London, shoots up a subsequent meeting of Starfleet brass in San Francisco, and then flees to Qo'noS. The crew of the Enterprise attempt to bring him to justice without provoking war with the Klingon Empire, but find there is much more to the agent's mission, and the man himself, than what the Fleet Admiral (Peter Weller) has told them; the agent is none other than Khan Noonien Singh; his allegiance and his motives are initially not at all clear. The Enterprise is ambushed and destroyed by countless alien microvessels; the crew abandon ship. Stranded on an unknown planet, and with no apparent means of escape or rescue, they find themselves in conflict with a new sociopathic enemy (Idris Elba) who has a well-earned hatred of the Federation and what it stands for. Star Trek Beyond was released on July 22, 2016, in time for the franchise's 50th anniversary celebrations. Roberto Orci had stated that Star Trek Beyond will feel more like the original series than its predecessors in the reboot series while still trying something new with the established material. In December 2014, Justin Lin was confirmed as the director for the upcoming sequel, marking the first reboot film not to be directed by J. J. Abrams, whose commitments to Star Wars: The Force Awakens restricted his role on the Star Trek film to that of producer. In January 2015, it was confirmed that the film would be co-written by Doug Jung and Simon Pegg, who revealed the film's title that May. Idris Elba was cast as the villain Krall, while Sofia Boutella was cast as Jaylah. Filming began on June 25, 2015. This is the last film of Anton Yelchin (Chekov), who died in an automobile accident on June 19, 2016. Pine and Quinto have signed contracts to return as Kirk and Spock for a fourth film. In July 2016, Abrams confirmed plans for a fourth film, and stated that Chris Hemsworth would return as Kirk's father, George, whom he played in the prologue of the first film. Later that month, Paramount confirmed the return of Hemsworth as well as most of the Beyond cast, producers Abrams and Lindsey Weber, and writers J. D. Payne and Patrick McKay. That same month, Abrams had said that Chekov would not be recast, after Anton Yelchin died in a motor vehicle incident. In December 2017, Deadline Hollywood reported that Quentin Tarantino is currently working on the next Star Trek theatrical installment with Abrams, with the intention being that the former will direct the film. Mark L. Smith, Lindsey Beer, Megan Amram and Drew Pearce took part in the writers room before Paramount finalized a deal with Smith to write the screenplay. Fans and critics have reacted with uncertainty to the news that Tarantino told Paramount that he planned for this to be the first R-rated Star Trek film. In April 2018, it was announced that two new Star Trek films are in development at Paramount. Later that month, it was announced that S. J. Clarkson will direct the second Star Trek film in development, and that the film will enter production before Tarantino's film. J. D. Payne and Patrick McKay will co-write the screenplay, while Abrams and Lindsey Weber will co-produce the project. In August 2018, it was announced that talks with Pine and Hemsworth to appear in the next film had fallen through. Both actors said the studio should abide by the existing deals regarding their salary, but Paramount wanted to keep the budget in check due to the past performance numbers. On January 9, 2019, it was reported that Paramount has canceled the current development of the fourth Star Trek installment, potentially ending the Kelvin timeline of the Star Trek universe. ^ This count includes all planned episodes of Star Trek Discovery through season two. it also includes the animated series, and the original pilot, "The Cage". Two-part episodes that were not originally aired at the same time are considered two separate episodes. Ten feature-length episodes were originally aired as two-hour presentations and in this count, they too are seen as two individual episodes. ^ Originally entitled Star Trek, it has in recent years become known as Star Trek: The Original Series or as "Classic Star Trek"—retronyms that distinguish it from its sequels and the franchise as a whole. ^ Film titles of the North American and UK releases of the films no longer contained the number of the film following the sixth film (the sixth was Star Trek VI: The Undiscovered Country but the seventh was Star Trek Generations). However, European releases continued using numbers in the film titles until Nemesis. ^ Star Trek (2009), Into Darkness, and Beyond are often considered to be, and referred to as, a "reboot". They are also a continuation of the franchise that establishes an alternate reality from the previous films. This was done to free the new films from the restrictions of continuity without completely discarding it. This new reality was informally referred to by several names, including the "Abramsverse", "JJ Trek", the "alternate timeline" and "NuTrek". It was named the "Kelvin Timeline", as opposed to the "Prime Timeline" of the original series and films, by Michael and Denise Okuda for use in reference guides and encyclopedias. The name Kelvin comes from the USS Kelvin, a starship involved in the event that creates the new reality in 2009's Star Trek. Leonard Nimoy plays an older version of Spock in the film Star Trek to help link the two timelines. ^ a b Lee, Luaine (2006-08-18). "KRT Wire | 08/18/2006 | 'Star Trek' turns 40". San Jose Mercury News. McClatchy News. Archived from the original on 2006-09-01. Retrieved 2008-12-15. ^ Wired Staff (September 15, 2006). "Original Star Trek Gets Upgraded". Wired. Retrieved March 30, 2019. ^ Dursin, Andre (2006-11-14). "The Aisle Seat by Andy Dursin". www.andyfilm.com. Archived from the original on 2011-10-03. Retrieved 2011-10-19. ^ "Star Trek Animated - The Series that ran from 1973 - 1974". www.sciencefictionbuzz.com. Archived from the original on 2011-07-16. Retrieved 2011-10-19. ^ "Star Trek - A Short History". www.ee.surrey.ac.uk. Archived from the original on 2010-12-05. Retrieved 2006-08-21. ^ "BBC Online - Cult - Star Trek - Next Generation - Trivia". BBC. Archived from the original on 2006-12-31. Retrieved 2019-03-24. ^ TrekCore Staff. "Netflix Brings VFX Fixes to STAR TREK: TNG in HD". TrekCore Blog. ^ "Emissary, Part I | Star Trek". www.startrek.com. Retrieved 2006-08-21. ^ "Review of "Inter Arma Enim Silent Leges" - Star Trek Fans". scifi.about.com. Archived from the original on 2003-04-07. Retrieved 2006-10-29. ^ Sturgis, Amy H. ": RevolutionSF - Star Trek Voyager : Final Episode : Review". www.revolutionsf.com. Retrieved 2006-08-24. ^ "Star Trek: Voyager [TV Series] Synopsis - Plot Summary - Fandango.com". www.fandango.com. Archived from the original on 2012-01-30. Retrieved 2011-10-19. ^ "Star Trek: Enterprise Summary". www.starpulse.com. Archived from the original on 2007-09-29. Retrieved 2006-08-24. ^ Lee, Patrick (2005-05-14). "Star Trek: Enterprise Series Finale | Movie and TV Reviews | SCI FI Weekly". www.scifi.com. Archived from the original on 2007-01-01. Retrieved 2009-01-16. ^ Leao, Gustavo (2005-12-17). "TrekWeb.com - Anthony Montgomery Says "These Are The Voyages..." Not an Effective Finale". trekweb.com. Archived from the original on 2006-03-07. Retrieved 2011-10-19. ^ Slotek, Jim (2005-05-13). "Star Trek: E lamely goes away". Toronto Sun. p. E4. ^ Ausiello, Michael; Roots, Kimberly (August 10, 2016). "Star Trek: Discovery: 'Prime' Setting, Gay Character, Heavy Alien Presence and 11 More Spoilers About CBS Reboot". TVLine. Archived from the original on April 29, 2017. Retrieved April 30, 2017. ^ Andreeva, Nellie (June 19, 2017). "'Star Trek: Discovery' Gets September Premiere Date On CBS & CBS All Access, Season 1 Split In Two". Deadline Hollywood. Archived from the original on June 20, 2017. Retrieved June 20, 2017. ^ Frankel, Daniel. "Moonves: Netflix international sales pay for entire 'Star Trek' production cost | FierceCable". www.fiercecable.com. Archived from the original on January 18, 2017. Retrieved January 16, 2017. ^ Andreeva, Nellie (May 17, 2017). "'Star Trek: Discovery' Gets Order Increase & Companion Show On CBS All Access". Deadline Hollywood. Archived from the original on May 17, 2017. Retrieved May 18, 2017. ^ Stanhope, Katie (May 17, 2017). "'Star Trek: Discovery' Official Trailer Unveiled". The Hollywood Reporter. Archived from the original on May 17, 2017. Retrieved May 18, 2017. ^ Hibberd, James (July 17, 2017). "Star Trek: Discovery producer explains why the Klingons changed". Entertainment Weekly. Archived from the original on July 17, 2017. Retrieved July 18, 2017. ^ Anderton, Ethan (July 21, 2017). "'Star Trek: Discovery' Exhibit Reveals Starfleet, Klingon and Vulcan Props, Costumes & Ships [Comic-Con 2017]". /Film. Archived from the original on July 22, 2017. Retrieved July 22, 2017. ^ Goldberg, Lesley (January 8, 2019). "'Star Trek': Second Animated Series, More 'Short Treks' Coming to CBS All Access (Exclusive)". The Hollywood Reporter. Retrieved January 13, 2019. ^ Goldberg, Lesley. "Patrick Stewart to Reprise 'Star Trek' Role in New CBS All Access Series". The Hollywood Reporter. The Hollywood Reporter. Archived from the original on August 4, 2018. Retrieved August 5, 2018. ^ Arenas, Jorge (February 13, 2019). "Patrick Stewart Reveals Time Period New Picard-Centric Star Trek Series Will Be Set In!". Bounding Into Comics. Retrieved March 17, 2019. ^ Andreeva, Nellie (October 25, 2018). "'Star Trek: Lower Decks' Animated Series From 'Rick and Morty' EP & Secret Hideout Ordered By CBS All Access". Deadline. Archived from the original on October 25, 2018. Retrieved October 25, 2018. ^ Patten, Dominic (January 14, 2019). "It's Official! Michelle Yeoh 'Star Trek' Spinoff In Development At CBS All Access". Deadline. Retrieved March 17, 2019. ^ Otterson, Joe (February 13, 2019). "'Star Trek' Animated Kids Show in the Works at Nickelodeon". Variety. Retrieved February 17, 2019. ^ Brown, Charles, ed. (October 1975). "Star Trek Movie". Locus. 1 (180). ^ Sackett & Roddenberry, 1–3. ^ Sackett & Roddenberry, 202–203. ^ Sackett & Roddenberry, 204–205. ^ a b Rioux, 240. ^ Star Trek cast and crew (August 6, 2002). Star Trek II: The Wrath of Khan, The Directors Edition: Special Features (DVD; Disc 2/2). Paramount Pictures. ^ Meyers, Richard (1990). The Great Science Fiction Films. New York: Carol Publishing Group. pp. 229–231. ISBN 0-8065-1084-6. ^ Bernardin, Mark (August 13, 2002). "Review; Star Trek II: The Wrath of Khan – The Director's Edition". Entertainment Weekly. Retrieved August 5, 2008. ^ Giles, Jeff (July 20, 2016). "Every Star Trek Movie Ranked From Worst To Best". Rotten Tomatoes. Retrieved May 23, 2018. ^ McNary, Dave (February 13, 2005). "Trekkers consider series' future". Variety. Retrieved June 1, 2007. ^ Hinman, Michael (April 12, 2006). "Star Trek XI Is Down, But It Is Not Out". SyFy Portal. Archived from the original on January 9, 2008. Retrieved September 24, 2007. ^ Siegel, Tatiana (February 24, 2007). "Abrams takes helm of Star Trek". The Hollywood Reporter. Archived from the original on May 8, 2008. Retrieved April 14, 2008. ^ ""The Kelvin Timeline"- Official Name for the New Star Trek Universe". MSN. June 27, 2016. Archived from the original on August 19, 2016. Retrieved July 24, 2016. ^ Staff, TrekCore (June 26, 2016). "STAR TREK Alternate Universe Finally Gets Official Name | TrekCore Blog". trekcore.com. Retrieved July 24, 2016. ^ "Exclusive Interview: Damon Lindelof On New Release Date and Trek Appealing To Wider Audience" (Press release). TrekMovie.com. Retrieved June 13, 2013. ^ "Star Trek". Rotten Tomatoes. Retrieved September 2, 2018. ^ "Star Trek (2009): Reviews". Metacritic. Retrieved September 2, 2018. ^ "Movie Releases by Score (2009)". Retrieved March 13, 2011. ^ Maane Khatchatourian. "'Star Trek 3′ Set in Deep Space – Variety". Variety. ^ Mike Fleming Jr. "Star Trek 3's New Director Will Be 'Fast & Furious 6′ Helmer Justin Lin – Deadline". Deadline Hollywood. ^ Kroll, Justin (May 14, 2014). "Roberto Orci to Direct 'Star Trek 3' (EXCLUSIVE)". variety.com. Retrieved June 23, 2017. ^ Mike Fleming Jr. "Simon Pegg Co-Writing 'Star Trek 3′ With Doug Jung – Deadline". Deadline Hollywood. ^ Sean Wist. "Simon Pegg confirms Star Trek Beyond title in his love letter to fantasy". joblo.com. ^ "'Star Trek 3′ Begins Filming in April; Bryan Cranston Rumored for Villain Role". Screen Rant. ^ "Idris Elba In Early Talks for 'Star Trek 3' Villain". The Hollywood Reporter. ^ Mike Fleming Jr. "'Kingsman's Sofia Boutella Lands Lead In 'Star Trek 3′ – Deadline". Deadline Hollywood. ^ "'Star Trek 3' Starts Filming; More Evidence It Will Be Titled 'Star Trek Beyond'". Slashfilm.com. ^ Kit, Borys (June 26, 2015). "'Star Trek 3' Stars Score Big Raises as Kirk and Spock for Fourth Movie (Exclusive)". The Hollywood Reporter. Prometheus Global Media. Retrieved June 27, 2015. ^ Chitwood, Adam (July 15, 2016). "Is Chris Hemsworth Returning for 'Star Trek 4'? J.J. Abrams Teases Next Sequel". Collider.com. Retrieved July 16, 2016. ^ Chitwood, Adam (July 18, 2016). "Fourth 'Star Trek' Movie A Go At Paramount; Chris Hemsworth Back As Kirk's Father". Deadline Hollywood. Retrieved July 18, 2016. ^ "Star Trek 4 is Officially a Go; Synopsis & Writers Revealed". screenrant.com. July 18, 2016. Retrieved June 23, 2017. ^ Slotek, Jim (July 13, 2016). "J.J. Abrams: 'Star Trek' won't replace Anton Yelchin". Toronto Sun. ^ Jr, Mike Fleming (December 5, 2017). "Quentin Tarantino Hatches 'Star Trek' Movie Idea; Paramount, JJ Abrams To Assemble Writers Room". ^ Fleming Jr, Mike (December 21, 2017). "Quentin Tarantino's Star Trek Firms The Revenant Writer Mark L. Smith As Screenwriter". Deadline. Retrieved December 21, 2017. ^ Gilyadov, Alex (April 26, 2018). "Star Trek: Paramount Developing Two Movies". ^ Kroll, Justin (April 26, 2018). "'Star Trek 4': S.J. Clarkson Becomes the First Female Director in Franchise's History (EXCLUSIVE)". Variety. Retrieved June 2, 2018. ^ Kit, Borys (10 August 2018). "Chris Pine and Chris Hemsworth 'Star Trek 4' Future In Doubt as Talks Fall Through (Exclusive)". Hollywood Reporter. Retrieved 3 January 2019. ^ Andreeva, Nellie; Petski, Denise (January 8, 2019). "'Game Of Thrones' Prequel HBO Pilot: SJ Clarkson To Direct; Naomi Ackie & 7 More Cast". Deadline Hollywood. Retrieved January 8, 2019. ^ Mendelson, Scott. "Paramount Has Canceled 'Star Trek 4', And Disney's 'Star Wars' Is To Blame". January 10, 2019. Retrieved January 10, 2019. ^ "Star Trek: The Motion Picture". The Numbers. Retrieved September 26, 2012. ^ "Star Trek II: The Wrath of Khan". The Numbers. Retrieved September 26, 2012. ^ "Star Trek III: The Search for Spock". The Numbers. Retrieved September 26, 2012. ^ "Star Trek IV: The Voyage Home". The Numbers. Retrieved September 26, 2012. ^ "Star Trek V: The Final Frontier". The Numbers. Retrieved September 26, 2012. ^ "Star Trek VI: The Undiscovered Country". The Numbers. Retrieved September 26, 2012. ^ "Star Trek: Generations". The Numbers. Retrieved September 26, 2012. ^ "Star Trek: First Contact". The Numbers. Retrieved September 26, 2012. ^ "Star Trek: Insurrection". The Numbers. Retrieved September 26, 2012. ^ "Star Trek: Nemesis". The Numbers. Retrieved September 26, 2012. ^ "Star Trek". The Numbers. Retrieved September 26, 2012. ^ "Star Trek Into Darkness". The Numbers. Retrieved August 2, 2014. ^ "Star Trek Beyond". The Numbers. Retrieved July 29, 2016. ^ "Star Trek Franchise Box Office History". The Numbers. Retrieved August 2, 2014. ^ "Star Trek: The Motion Picture". Rotten Tomatoes. Retrieved September 2, 2018. ^ "Star Trek: The Motion Picture (1979): Reviews". Metacritic. Retrieved September 2, 2018. ^ Ebert, Roger. "Star Trek: The Motion Picture Movie Review (1979) - Roger Ebert". www.rogerebert.com. ^ "Star Trek II: The Wrath of Khan". Rotten Tomatoes. Retrieved September 2, 2018. ^ "Star Trek II: The Wrath of Khan (1982): Reviews". Metacritic. Retrieved September 2, 2018. ^ Ebert, Roger. "Star Trek II: The Wrath of Khan Movie Review (1982) - Roger Ebert". www.rogerebert.com. ^ "Star Trek III: The Search for Spock". Rotten Tomatoes. Retrieved September 2, 2018. ^ "Star Trek III: The Search for Spock (1984): Reviews". Metacritic. Retrieved September 2, 2018. ^ Ebert, Roger. "Star Trek III: The Search for Spock Movie Review (1984) - Roger Ebert". www.rogerebert.com. ^ "Star Trek IV: The Voyage Home". Rotten Tomatoes. Retrieved September 2, 2018. ^ "Star Trek IV: The Voyage Home (1986): Reviews". Metacritic. Retrieved September 2, 2018. ^ a b c d e f g h i j "CinemaScore". CinemaScore. Retrieved January 5, 2019. ^ Ebert, Roger. "Star Trek IV: The Voyage Home Movie Review & Film Summary (1986) - Roger Ebert". www.rogerebert.com. ^ "Star Trek V: The Final Frontier". Rotten Tomatoes. Retrieved September 2, 2018. ^ "Star Trek V: The Final Frontier (1989): Reviews". Metacritic. Retrieved September 2, 2018. ^ Ebert, Roger. "Star Trek V: The Final Frontier Movie Review (1989) - Roger Ebert". www.rogerebert.com. ^ "Star Trek VI: The Undiscovered Country". Rotten Tomatoes. Retrieved September 2, 2018. ^ "Star Trek VI: The Undiscovered Country (1991): Reviews". Metacritic. Retrieved September 2, 2018. ^ Ebert, Roger. "Star Trek VI: The Undiscovered Country Movie Review (1991) - Roger Ebert". www.rogerebert.com. ^ "Star Trek Generations". Rotten Tomatoes. Retrieved September 2, 2018. ^ "Star Trek: Generations (1994): Reviews". Metacritic. Retrieved January 5, 2019. ^ Ebert, Roger. "Star Trek: Generations Movie Review (1994) - Roger Ebert". www.rogerebert.com. ^ "Star Trek: First Contact". Rotten Tomatoes. Retrieved September 2, 2018. ^ "Star Trek: First Contact (1996): Reviews". Metacritic. Retrieved September 2, 2018. ^ Ebert, Roger. "Star Trek: First Contact Movie Review (1996) - Roger Ebert". www.rogerebert.com. ^ "Star Trek: Insurrection". Rotten Tomatoes. Retrieved September 2, 2018. ^ "Star Trek: Insurrection (1998): Reviews". Metacritic. Retrieved September 2, 2018. ^ Ebert, Roger. "Star Trek: Insurrection Movie Review (1998) - Roger Ebert". www.rogerebert.com. ^ "Star Trek: Nemesis". Rotten Tomatoes. Retrieved September 2, 2018. ^ "Star Trek: Nemesis (2002): Reviews". Metacritic. Retrieved September 2, 2018. ^ Ebert, Roger. "Star Trek: Nemesis Movie Review (2002) - Roger Ebert". www.rogerebert.com. ^ Ebert, Roger. "Star Trek Movie Review & Film Summary (2009) - Roger Ebert". www.rogerebert.com. ^ "Star Trek Into Darkness". Rotten Tomatoes. Retrieved September 2, 2018. ^ "Star Trek Into Darkness (2013): Reviews". Metacritic. Retrieved September 2, 2018. ^ a b Seitz, Matt Zoller. "Star Trek Into Darkness Movie Review (2013) - Roger Ebert". www.rogerebert.com. ^ "Star Trek Beyond". Rotten Tomatoes. Retrieved September 2, 2018. ^ "Star Trek Beyond (2016): Reviews". Metacritic. Retrieved September 2, 2018. ^ Seitz, Matt Zoller. "Star Trek Beyond Movie Review (2016) - Roger Ebert". www.rogerebert.com. Trimble, Bjo (Oct 1986). Stine, Hank (ed.). On the Good Ship Enterprise: My 15 Years with Star Trek (Reprint ed.). Norfolk, Virginia: The Donning Company. ISBN 0-89865-253-7. Turnbull, Gerry, ed. (Oct 1979). A Star Trek Catalog. New York: Grosset & Dunlap. ISBN 0-441-78477-1. This page was last edited on 18 April 2019, at 13:48 (UTC).